Over the past year or so, there has been a BIG boost in student work here in the Theatre and Dance department. While there is the Studio Series that is completely student-run once a semester, there have been a number of students whose Studio Series applications may have been denied or simply want to do their work independently that have been produced. 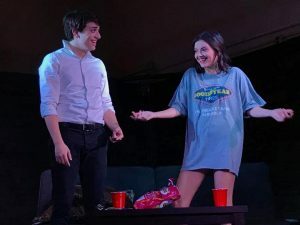 Last year’s Seminar seemed to have been the spark that ignited students’ interest and confidence that they could produce a show without help from the department. Stacey Heishman, who played Kate in the show, submitted Seminar as a Studio Series production, and it was unchosen. However, she had a passion for the show and story and was determined to make her vision a reality: “Seminar had just been this little thought in the back of my head, but I was never able to do anything with it until one semester I went through a lot of life changes, and through that decided I needed to produce that show. I talked to a couple student organizations, and they were currently focused on other projects, so Seminar was put on hold again. Weighing all my options, I decided to start the project myself… I was ready to make something for myself that I could be proud of.” Seminar was one of the student favorites for the year, winning several awards at the Vickie’s for the 2017-2018 academic year. It also made students realize that there were new avenues for work that they were passionate about. The cast of Seminar. Stacey Heishman as Kate. Kayla Stadler as Doris. Mason Kirkland as Leonard. Erin Hill as Izzy. 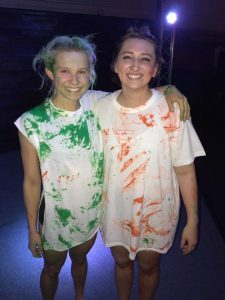 Moving into this academic year, Tabula Rasa, a student-run production company that has always focused on student work, produced a dance show entitled Forms. Inspired by the Studio Series’ choice of a dance show in the fall, Hunak, Tabula Rasa encouraged our dance students to come be a part of student work as well. Marketing Director of Tabula Rasa, Josh Crotty, discussed the Tabula Rasa Board’s inspiration behind choosing Forms and their other productions: “I think we felt that we wanted to give more opportunities for a lot of dance majors to present their own work in a more relaxed setting. 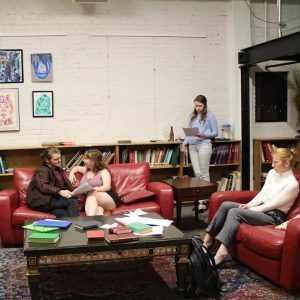 We wanted to make it known that Tabula Rasa recognizes our department as a whole and wants to give everyone as many opportunities as possible to perform their own work.” Forms became not only an avenue for student work, but also, proof that student work wasn’t only reserved for theatre students. Jessica Staples and Olivia Morgenthaler after their performance in Forms. Matt Huebner as Marcus and Amalea Cox as Trisha in Shoulda Coulda Woulda. As the semester progressed, we saw Mallory Maggi’s production of Dog Sees God come to life. Dog Sees God has been a personal favorite of Maggi’s for years. After working at Tent Theatre over the summer, she realized she would have some extra money lying around and wanted to put that money to good use. She employed the work of her friend and Tent Theatre colleague, Steven Horn, to direct the show while she would play a role she always found fascinating, Van’s Sister (inspired by none other than Lucy in the Charlie Brown series). She also made it very important for proceeds to be given to The Trevor Project, a non-profit organization that features a national 24-hour, toll free confidential suicide hotline for LGBTQ youth. Maggi saw Dog Sees God as an opportunity to create art independently, taking on most of the behind-the-scene duties as well, giving her a sense of freedom that you can’t always get in a normal production. The cast of Dog Sees God. Tyler Armer as CB. Cameron Perry as Van. Emma Keifer as CB’s Sister. Erin Hill as Tricia. Paola Martinez as Marcy. 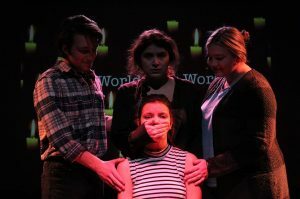 Moving into this semester was the production of Parliament Square proposed by Terra Ashe and Trish Price and produced in collaboration with UCYA. When Terra Ashe traveled to London last year, she was able to see a brand-new production there in the West End. In Bush Theatre, she witnessed a show asking how far you would go for the things you believed in. She brought her memories and inspiration that had been ignited through Parliament Square back with her to Missouri State. She explains, “I bought the play immediately after I saw it, I wanted to be a part of that story so bad, to experience this show. I thought people should see it… I found a show that made me feel so much, that I found a challenge and a great opportunity in and simply couldn’t pass up the possibility of being able to do it, so I did it.” She asked her fellow classmate, Trish Price, to join in her project as director, and the two of them produced Parliament Square through the University Coalition of Young Artists (UCYA). This production not only gave opportunities to the actors in our department but also to tech students as well. Being a very tech-heavy production, this saw the inclusion of students across different programs to use their talents where they might not have been able to before. The cast of Parliament Square. Tucker Barry as Tommy. Cassandra DeFrietas as Kat. Hailey Hance as Mum. Amalea Cox as Jo. And the student work doesn’t stop there. Last weekend, Cassandra DeFrietas and held auditions for a production of The Importance of Being Earnest. Tori Jost and Thomas Fischer are producing Still Life with Iris in collaboration with UCYA that will be holding auditions February 25th and 26th. 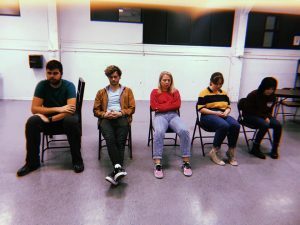 Tabula Rasa has announced two new shows for this semester: And Then Some written by our very own T&D Bear, Elaina Creighton, and Hand to God proposed by Steven Horn and Cameron Perry.